Canadian native art...especially contemporary Ojibwa art...is sourced by a deep well of native legends and myths and it's become one of the last connections between the spiritual interpretation of a declining Ojibwa culture and the modern world. 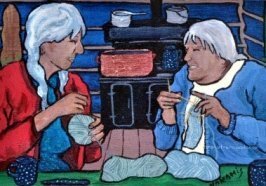 I want to tell you about the Ojibwa people...as they were when I was a child and as they are now...and the thread that I'll draw through many of my stories will be Canadian native art. 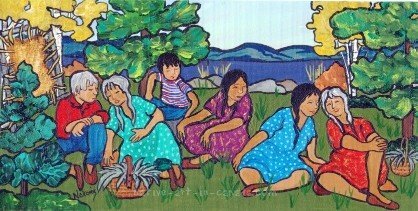 I'm an Ojibwa artist and storyteller who grew up in the bush north of Lake Superior more than seventy years ago. In one context my name simply means grandmother. But I was a toddler, not a grandmother when I was given the name by the elders of the turtle clan, so some explanation is in order. The literal translation of Nokomis means "the great mother" because my namesake was the mother of Manitou's children. . . the spirit who brought forth the Ojibwa into the world. When the elders gave me the name, they expected me to live up to it. They actually expected me to head out into the world and create the Ojibwa! Sheesh! They didn't say HOW! It took fifty years but I finally figured out how to be me. I decided that the only way I could create the Ojibwa in the modern world was to tell their stories. And what's a story without a good picture to go along with it? So I tell stories about what is was like to grow up as an Ojibwa child living in the bush almost eighty years ago. In my own naive way I illustrate those stories. I used to travel across the country telling the stories and selling my art, but now that my legs don't work I'm starting to master this world wide web thing-a-ma-jig so that I can tell you about the Ojibwa. This way of learning that comes from listening to cultural stories is called bzindamowin. I don't think there's ever been a time I didn't tell stories. In the bush, stories were entertainment. My father could go on a two day hunting trip and by the time he got home it was a two week story. My mother could cross the lake and have a cup of tea with her friend and by the time she got back she had enough stories to fill a book. But stories were also used to educate...to make a point, to explain why some behaviors were inappropriate, why it might be best to choose another course of action, and especially to explain the mysteries of the universe. What you may not know is that Canadian native art is the reason why many of those stories are still told. There's always been a great blossoming of artistic and ritualistic activity in response to cultural calamities. It happened three times in the prehistoric Eastern Woodlands cultures and it's happening today as First Nations people face extreme cultural pressures to conform to mainstream mores. The stylized imagery that shows up in the works by many contemporary woodland artists is what sparks conversations about the beliefs and stories that were once fundamental to a way of life that is all but gone. and, besides that, I just wanted young people to know what it was like to live in the bush without electricity, without running water and without a store close at hand. I've always been a storyteller but I haven't always been an artist. The world of Canadian native art would have passed me by if it hadn't occurred to me somewhere in the middle of my sixth decade, that a good story might be even better if it had a good picture to illustrate the point. I haven't had any training in the area of art. My work is sort of naive, but what the heck...it's my life and I get to paint it any way I please! I used to travel back and forth across the country showing my pictures and telling my stories but old age has caught up with me. Nowadays I can barely walk let alone load and unload my van by myself. I still want to tell stories so a few years ago I decided that it was finally time I learned how to be a techie so that I could sit on my duff and spread the word about Canadian native art and the great Ojibwa through this world wide web thing. Who woulda thunk that being a techie is almost as easy as being an artist? It's just been a matter of hooking up with the best web site building company in the whole world...and telling some more stories. Which is just my way of saying I've finally got a store operational on my website! The link is somewhere up the top of this page. I feel like I've given birth! It took me waaaaaaaaay longer than I expected but now it's done. If my kids are reading this they're probably either laughing out loud or breathing a deep sigh of relief. You see, when I was on the road telling stories about Canadian native art and how it explains First Nations culture, I printed up note cards and prints that I sold to all the nice folks who sat down and listened to me. But when I had to stop traveling I just piled all that stuff in the basement and forgot about it. I know that secretly the kids have been rolling their eyes and muttering to one another that they'll have to be the ones to figure out what to do with all those goodies when I'm gone. Hmph! I just figured it out for them. I'm going to sell it all to you! Not only that, I'm going to give you the opportunity to buy Canadian native art from many of my artsy fartsy woodland artist friends, too. Here's a link to the new store. My life in the bush and links to my art and stories. The story about the spiritual Nokomis and how she re-created the world so that she had a place to give birth and raise Gitchee Manitou's children . . . that's you and me.